Two Palestinian militants trying to enter Israel from Gaza have been killed in a clash, with one Israeli soldier also injured, Israel's army says. A 20-minute gun battle erupted when the pair were spotted near the security fence separating Gaza and Israel. The Israeli soldier, whose condition was not known, was evacuated by helicopter. 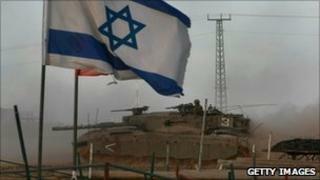 Israel's army says there has been an increase in incidents along the border with Gaza in recent days. Following rocket and mortar attacks earlier this month, Israel's top military figure warned the army was preparing for a clash with Hamas. "The fighting near the security fence will continue and we must be prepared, perhaps to operate on a broader level," Lt-Gen Gabi Ashkenazi, chief of Israel's general staff, said this week. "The next round [of fighting] will be extensive and it should end in such a way where there is no doubt as to which side triumphed." Israel's last major action in Gaza, a 22-day operation known as Operation Cast Lead, which began in late December 2008, left at least 1,300 Palestinians and 13 Israelis dead.